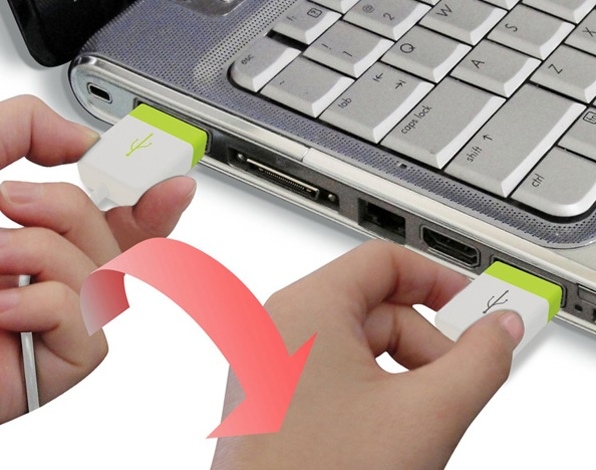 It happens to me about, oh, 14 trillion times every day: I go to plug something into my computer’s USB port, and it doesn’t fit because I’ve got the plug-head upside down. Then I mutter some curse word, peer at it, and then plug it in the right way. If I added up all the seconds I waste this way in a year, it’d be… well, it’d be enough that I thank the design gods for Ma Yi Xuan, who invented a USB plug that fits both effing ways. Before you think about mocking the bad English, ask yourself: did I think of this? No? Then STFU. 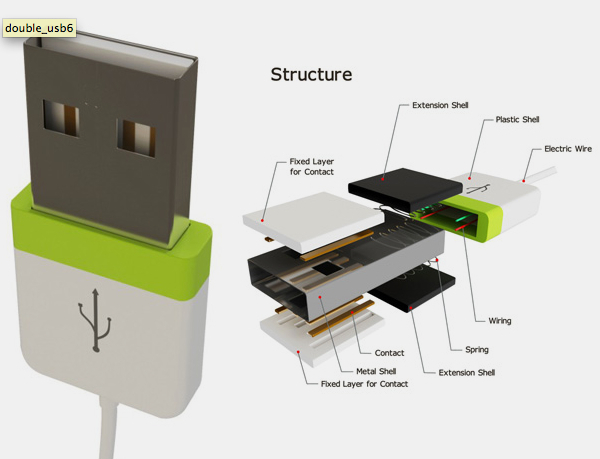 I don’t consider this a piece of genius design on Ma Yi Xuan’s part as much as a completely boneheaded example of design FAIL on the part of every USB manufacturer ever. Ma Yi Xuan’s simple common sense just looks like genius in comparison. Although for that, she still deserves the design version of the Nobel Peace Prize in my book. The key to her design is just an extra fixed piece of squishy plastic (in addition to the one already in USB plugs) to press the electrical contacts into place, regardless of which side is facing up. 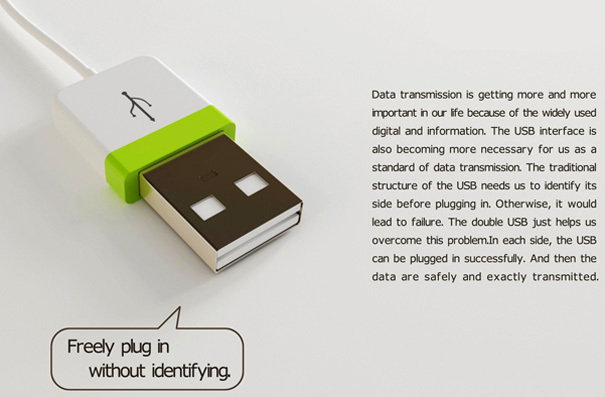 So why aren’t all USB plugs like this already? Perhaps there are myriad reasons why this design is impractical, electrical-engineering-wise. I don’t care. I want my peripherals to be convenient and idiotproof, not be told why they “can’t” be. Does Xuan’s design not make sense for mass-produced electronics? Well then figure out how to make it make sense, you bush-league blockheads! We put a man on the moon using the computing power of a toaster, but none of you geniuses thought of this until now?